By Land, By Sea Or By Air, Just Tell Us Where, We'll Get It There. 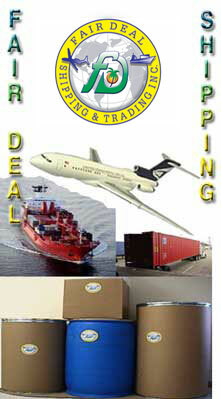 Fair Deal Shipping & Trading Inc . . . Your Artery To The Caribbean And The Rest Of The World. We know you have several choices and we thank you for choosing us. Fair Deal Shipping & Trading Inc. is a company of experienced, friendly people, dedicated to providing you with the best freight handling and trading services possible. Our staff averages over 25 years of industry experience. We're not hampered by several layers of management; the person you deal with is authorized to make decisions . . . we want you to be happy that you chose to do business with us. Whether you are shipping commercial cargo, household goods or personal effects; whether it’s a container, an automobile, a pallet or a barrel; if it’s going international, you can depend on Fair Deal for reliability, courtesy and efficiency. © Copyright 2002 Fair Deal Shipping Inc. All rights reserved.